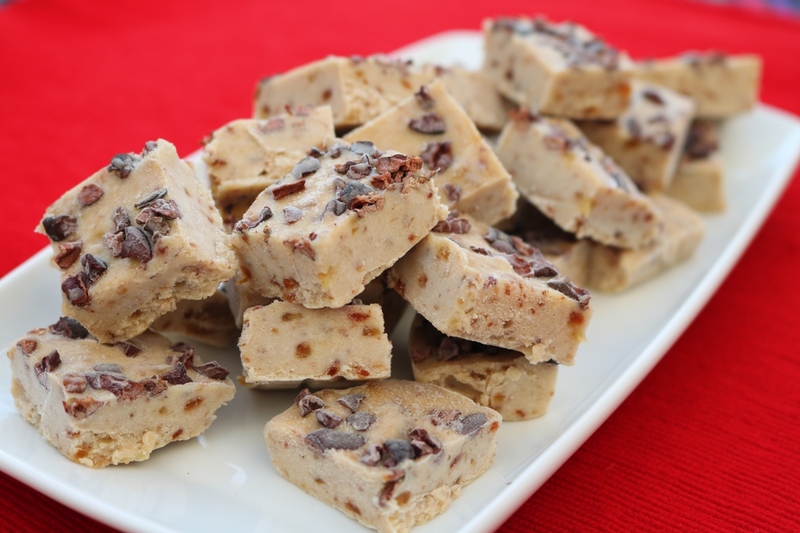 This freezer fudge as well as being sugar and dairy free is easy to make and a delight to eat. Although frozen it doesn’t set hard or become too cold and so can be eaten straight from the freezer or after a few minutes defrosting. If you have ready prepared date puree (see latest recipes on the website) you can use a portion instead of the dates and water. 1 Place the chopped dates in a small bowl and cover with the boiling water. Leave to stand for 30 minutes. If using ready prepared dates miss this step. 2 Line the tray with parchment. 3 Place the date mixture, coconut oil, vanilla extract, tahini and a pinch of salt into a food processor and blitz until smooth and creamy. 4 Spread the mixture evenly into the prepared container and sprinkle the cacao nibs over the surface, pressing them gently into the fudge with your fingers. 5 Freeze until solid then cut into bite sized pieces and place in a seal-able container back in the freezer until needed.